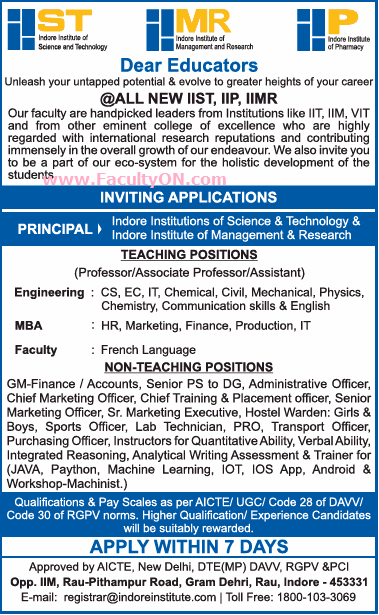 Indore Institute of Science and Technology, Indore has advertised in THE TIME OF INDIA newspaper for the recruitment of Professor / Associate Professor / Assistant Professor / Principal Plus Non-Faculty jobs vacancies. Interested and eligible job aspirants are requested to apply within 07 days from 25th July 2018. Check out further more details below. About College: Located in a plush 50 acre campus opposite IIM Indore, Indore Institute of Science & Technology (IIST) is amongst the Top 10 Engineering Colleges of Madhya Pradesh (MP) and amongst the best engineering colleges of Indore. Set up in 2003 under the Shail Education and Welfare Society, IIST has quickly ascended to this position by ensuring a high focus on quality education and effective as well as holistic development that further translates into high placements. As per AICTE / UGC / Code 28 of DAVV / Code 30 of RGPV norms. Salary: As per AICTE / UGC / Code 28 of DAVV / Code 30 of RGPV norms. Higher qualified and experienced candidates will be suitably rewarded. How to Apply: Interested and eligible candidates are requested to send application along with CV, copies of certificates / mark sheets and recent PP size photos to the following postal address or email address.